PT, OT, and Speech: Understanding the Rehab in "Nursing and Rehab"
Rehabilitation in a nursing home can cover many things, but you might not know what those are. When we talk about rehab at Rest Haven, we are most often referring to physical therapy, occupational therapy, and speech therapy. They may seem interchangeable, but they’re quite different. Check out this quick rundown and learn more about the rehab in ‘nursing and rehab’! What is it? Physical therapy, or PT, is what most people think of when they hear ‘therapy.’ PT works with residents following injury, surgery, or disease, with the goal of restoring mobility. They will evaluate and diagnose difficulties in movement and work to improve the muscles and joints themselves in the hopes of improving or correcting the problem. Physical therapy can help minimize the need for long term reliance on pain medication and teach a resident how to manage their condition for optimum movement. When do they help? In a nursing home, PT can help improve or maintain the mobility of residents who are no longer as active as they used to be. They may be called in to help a resident with frequent falls, unsteady walking, poor balance, difficulty transferring, decrease in range of movement, and more. What is it? Occupational Therapy, or OT, focuses more on improving a person’s ability to perform the meaningful actions in daily life than correcting a physical problem. OT teaches a resident to incorporate new life skills and tools to help them carry out tasks such as bathing, hygiene, and household chores, even if they have experienced a big change, such as stroke or major surgery. Occupational therapists may also perform in-home visits and offer recommendations or improvements that can be made for a better quality of life. When do they help? In a nursing home, OT helps our residents perform Activities of Daily Living like bathing, dressing, and using the bathroom. 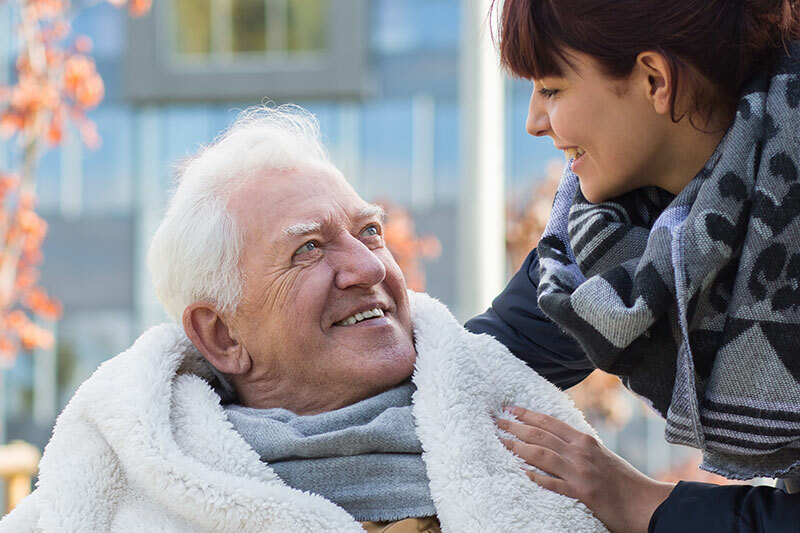 They may be referred to if a resident is having difficulty feeding themselves, completing routine grooming and bathing, or sitting properly in a chair or wheelchair. Occupational therapy is also in charge of any adaptive tools a resident may use, such as braces or splints and positioning pillows. What is it? Speech therapy—commonly referred to as ST or simply ‘speech’—is often overlooked in comparison to physical and occupational therapies, but it is just as important. If PT helps a resident move around and OT helps them live their lives, speech therapy helps them communicate with the world around them. As their memory or cognition fades, nursing home residents may have difficulty expressing themselves or understanding others. They may also need help with the more mechanical aspects of communication, such as swallowing, chewing, or lip movement. When do they help? ST may be called in to help in a wide variety of situations, both physical and mental. Cognitive changes that would lead to speech therapy include increase in confusion/disorientation, decrease in memory or recall, difficulty speaking or expressing needs, and frequent repetition of words or phrases. More physical signs ST can help with include a difficulty or inability to chew or swallow, pocketing food instead of swallowing, and coughing during or after eating. These three disciplines may each have a different focus, but all three work together seamlessly to achieve one goal: improving the quality of life for each resident here at Rest Haven. Whether it is a short term resident who needs to get back on their feet before returning to the community, or a person who has chosen to make their home here long term, rehabilitation and therapy can make for a healthier, and therefore happier, life. One of the most difficult adjustments for someone living with Alzheimer’s disease or other dementias is the change in their ability to communicate with those around them. Conversing with someone with dementia can be an exercise in frustration for all parties involved. Below are a few tips to keep in mind next time you’re visiting your loved one. Be welcoming. Don’t sneak up on your loved one and start a conversation. They’ll be startled and more easily agitated than if you take a moment to get their attention first. Sit at their level, introduce yourself, and make eye contact. Using their name will help to focus their attention, as well. Once you are sure their attention is on you, you can start your conversation. Be clear. Speak slowly and plainly. Their ability to follow conversations is diminished, so it is best to use shorter words and phrases. Be specific about what you are speaking of, instead of using more general words like ‘it’ or ‘that.’ A lower-pitched tone of voice can also be more soothing and easier for your loved one to follow. Be patient. Your loved one is going to take longer to process and respond to your questions. Give them time. Offer suggestions if they seem to be looking for a word, and only repeat yourself if you’ve given them sufficient time to reply. Also, be sure to ask only one question at a time. Overwhelming them with words and questions is a quick way to shut down your conversation. Don’t argue. This can be hard, as you may want to correct them if they’re wrong about something, but arguing will only upset your loved one. Instead of arguing, try to find the meaning behind their words. They may be having difficulty organizing their thoughts logically and using the wrong words to express themselves. Smile. Your feelings and reactions can affect their feelings and reactions. If you’re tense, your loved one will be, too. Positive, nonverbal signals like facial expressions and body language can make a world of difference when communicating with someone living with dementia. Maintaining a sense of humor can keep both your conversation and your loved one relaxed. When in doubt, take a moment to smile. It’s the easiest way to make someone feel safe, secure, and at ease. These are just a few tips to make visiting your loved one easier. For more information on this subject and others facing family members and caregivers of persons with dementia, please visit www.alz.org/care or www.caregiver.org.